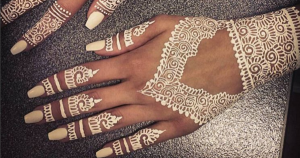 Loving the new henna craze this summer? Traditionally Henna is well known in India and the Middle East for occasions such as holidays, birthdays and weddings. Now the trend has spread worldwide. Today henna is being used a lot more for fashion and creative purposes. If you can’t bear to go through the pain of getting permanently inked, henna is a great temporary alternative. Instagram is full of bloggers, beauty entrepreneur’s and celebrities such as Rihanna, Selena Gomez, Katy Perry, Beyoncé, Vanessa Hudgens and Cody Simpson showing off their new temporary tattoo designs. With festival season on our doorstep, many festival goers are turning to henna to complete their look and help them to stand out from the crowd. The Vanity Van Team can bring these techniques to your next event or campaign and help your guests to stand out from the crowd too! Henna is a paste made out of crushed leaves from guess what? A plant called henna! The henna plant is found and grown in South Asian and North African countries. Once the paste is applied to skin and left for a few hours, it then leaves a stain to the skin which can last from 7 to 14 days. White henna is applied in the same way and for Golden henna once you have applied the paste, brush a layer of mehron powder over the pattern and brush off the excess to create that metallic look. We have recently been drawn to the beautiful white and gold henna trend, a beauty bloggers favourite, which looks great with a tan and summer outfits. White henna look gives a delicate finish, as if lace has been applied to the skin. This trend started in the Middle East where brides opted for white, instead of the traditional brown. To attend your summer events in style, team your white henna look with a white outfit and a pale coloured pastel nail varnish. Also known as a metallic henna. This look is very elegant and feminine. This trend has come from Dubai, from a renowned Japanese jewellery designer Nobuhiko Akatsuka. Golden henna will give you a fabulous shine at the special events you have planned. When people get their very first henna, they tend to start off with a more universal design until they find one more tailored to them. Designs such as butterflies, flowers, mandalas, YingYang and stars are among the more common designs. While henna has become an art, there are hidden meanings behind certain designs and where on the body it is. Dependent on where you get the henna, it can hold a significance. For instance, having a design on your hand signifies an offering from you to the world, while, on the back of your hand signifies protection. We can provide make up artists to deliver these fantastic treatments into any event or campaign anywhere in the UK drop us a line at bookings@vanityvan.co.uk to discuss the details. Vanity Van had their biggest salon yet for their sixth year trading at Glastonbury this year. Based in the John Peel area of the festival the operation has been doubled in size this year to cope with the insane demand from festival goers. The Vanity Van’s Glastonbury festival salon received over 800 pre-bookings from as far away as Australia and Dubai. The clients and rain both came in floods to use our hero Batiste products and to make the most of our DIY stations to resurrect those damp frizzy locks. Vanity Van had the biggest alfresco salon ever trading at Glastonbury featuring 9 stylist stations and 13 DIY slots which were fully booked all day Friday and Saturday and in total saw almost 1700 customers in their record breaking salon over the weekend. Plaits and glitter face art were the two main trends this year with festival goers coming in their hundreds in need of colourful sparkly face makeup and boho style plaited updo’s. Bouffants, big hair and curls were also hugely popular which the team used Pixie Lott’s fun and floral to give hair that clean, fresh look and leave it smelling gorgeous. To create quiffs volume and general body we used buckets of XXL Plumping Powder. Express hair styling was a popular request this weekend where hair was getting frazzled in the baking sun then the next minute being rained on and left a frizzy mess. Our stylists used Batistes conditioning mist which contains Argan oil to smooth out the flyaways and add back some much needed condition to the ends. Glitter was found in unimaginable places around the salon and campsite as punters were throwing it over each other and sharing it via hugs like some sort of contagious bug. Some clients were asking for a dash of glitter as a reminder of the festival when they got home so people in the office would know they had been. Others didn’t even realise they had it anywhere on their body until we pointed it out. Face paints over the eye were popular for the women and children we had in the salon and one customer even had Dolly Parton drawn onto her cheek as she was a big fan, we added glitter too of course! Other face paints included full face sugar skulls and a special birthday tiger for a lucky customer! Our hair wash stations were incredibly popular and welcomed a wide range of clients including staff on site and people of all ages wanting that fresh feeling that only a hair wash can give. Our assistant manager Graham was on hand with jugs of warm water to speed up the system when the queues reached an all time high level. Our new power pump showers proved a success and gave our clients fast, powerful hair washes. Massages were also very popular for those tired aching muscles after the first day of torturous, gruelling work getting the tents put up, although luckily it wasn’t yet raining at this point. The team were digging their feet deep into the sticky mud that overtook the salon to massage the clients at a good pressure and aid sore backs, necks and shoulders. Also Sunday saw a mass influx of battered festival goers who after 3 days of trudging around in the mud were in agony. We had lots of regulars and repeat customers this weekend including celebrity Angel Haze. She came in for her personal favourite the luxury makeover shes also a fan of a massage and supped lemon honey tea while she had her treatments. She left with bouncy, glamorous curls and bold makeup to go on stage later in the day. The team were really happy to see that The Kooks were revealed as the “TBA” acts on Sunday at the John Peel stage next door to the salon. The girls were all dancing and singing along to their music which we could just about hear from the salon. The Kooks were visitors to the Vanity Van at Radio Ones Big Weekend. Dolly Parton surprised the crowd with a miniature diamond encrusted saxophone and performed the Benny Hill theme song which had everyone laughing and joining in. She never fails to entertain her fans. It was a crazy, fun-filled week for all involved. Glastonbury didn’t fail to deliver both rain and happy punters definitely its best one yet. The team are already looking forward to to next years event. The Vanity Van salon are poised and ready for their next adventure at Latitude Festival and will also be backstage at Leeds and front of house at Rewind. Vanity Van featured at Isle of Wight festival this weekend taking prime position on route between the campsite and the arena delivering an array of hair, make up, beauty and massage treatments to the festival goers. Vanity Van had an awesome weekend at Isle of Wight Festival 2014, and loved being back at one of their all time favourite festivals. The public lapped up being pampered and styled in the sun by the therapists who were armed with all the latest Batiste Dry Shampoo products. The baking sun brought in the happy festival goers in their droves so that they could achieve the latest festival trends, beauty looks and hair styles and was definitely the place to be seen at Isle of Wight. Vanity Van was situated in the main thoroughfare through to the festival from the campsite so the punters could swing by on their way into the festival and see their favourite acts confident they were looking their best. One of the biggest trends of the festival were plaits. Customers booked in in their droves for them in all shapes and sizes with the retro festival look featuring a braid along the crown being the most popular. Finished off with a bit of Batiste Conditioning Mist to tame flyaway’s and leave a sleek finish made it easy for the customers to look as glamorous at a festival as the celebrities. Face painting as always was a very popular treatment with fans of the Red Hot Chili Peppers flocking in to get their face painted with the bands logo and glittery chillis on the face. Saturday saw a sharp intake of England fans wanting the England flag face paint, ready for the World Cup game later that evening. And florals were huge this weekend with many fans sporting gorgeous floral headbands and having face and body art to match. Isle of Wight also gave Vanity Van a chance to see some of their celebrity customers perform, Katy B and her dancers who are regular customers tore up the Big Top on Friday night. Her high energy set had everyone jumping around. And let’s not forget the boys we saw many male customers throughout the weekend for male hair styling and even manicures. Man of the moment John Newman gave a superb performance on Saturday afternoon after having Batiste’s XXL Plumping Powder used on him at an earlier event so that his bouffant hair would hold up for his performance. He certainly knows how to rock that quiff! We are very happy to announce Vanity Van will be featuring once more at Isle of Wight festival 2014. We will be offering hair cuts and styling, make up, face / body art, nails, facials, waxing, tanning and massage to members of the public and will be situated in the main thoroughfare into the festival from the campsite. We have built a brand new booking system this year to enable you to book your own appointments with ease. Please find below all the information you need about the salon and how to book with us this year. Please see below for our latest price list. Prices have gone up by a couple of pounds this year due festivals now charging VAT for the site however all hair customers will receive an amazing FREE gift from Batiste Dry Shampoo of a XXL Plumping Powder (worth £3.99) and all other clients will receive a Batiste Dry Shampoo Cherry 50 ml (worth £1.99). Please note within the booking system as payments are taken online either via paypal we have had to add a small 4% charge into the featured price – but you can see the actual price on the description of the treatment. You will also see our festival recovery packages on the price list – there was no way of adding these to the appointment schedule due to the multiple treatment options so if you would like these please email back all the info and we will book it in manually for you. To book please click on this link – payment is taken during the booking process using paypal. If you don’t have a paypal account you can still pay through paypal using a debit card using their Account optional service. You can book multiple appointments per person on the same or different days BUT for different people you must book separately as we need all of your contact details and booking – so please forward this email onto your friends so they can book and pay for their own appointments individually. You book the hair appointment for the time of the styling slot – don’t forget you will need to arrive 20-25 mins early to book in for your 15 min washing slot if you are using our Do It Yourself washing facilities before your DIY styling slot or your styling with a hairdresser slot. If you want to book more than one type of treatment one after another on a particular day simply select all those you want then book the start time of those treatments. If you want to book multiple slots for the same treatment on different days click on the recurring appointments option at the end and it will allow you to select extra days. Our salon will be based in the John Peel area towards the end of the row of shops by the entrance to Silver Hayes and the wall of flag installation. We will send out formal confirmation of this and any landmarks visible to help you find us once we are on site and set up on Mon/Tues. Please arrive for ALL appointments 5 minutes early to book in and to allow for queues as the salon gets very busy. For ALL hair appointments where you have booked a wash please arrive 20-25 minutes early – this is because a 15 minute slot is allocated before your hair appointment for you to wash if you wish. If you have booked for a hair appointment with a wash we will have a selection of battery operated shower heads and pump action shower heads to enable you to wash your own hair into sinks and tubs. We will have extra urns heating water from 5.30am this year however we cannot promise the water will always be hot later on in the day due to the huge demand and also electricity restrictions mean we cannot run all the heaters once the hair dryers are on. You are however welcome to either shower before you come to us or use our showers to wash your own hair. We provide all shampoo and conditioner. Please remember to bring your own towel. Using make up, face/body paints, glitters, diamantes etc..
DIY wash and style; express eye makeover; express refresh massage; express tan OR express manicure. Express hair styling; basic makeover; rapid relax massage; express tan, basic manicure or express pedicure. Multiple treatments – bulk book for the weekend or together with friends!